Filled with rich, multi-textured, and creative conversations, personal shifts from despair to hope occurred for many participants. 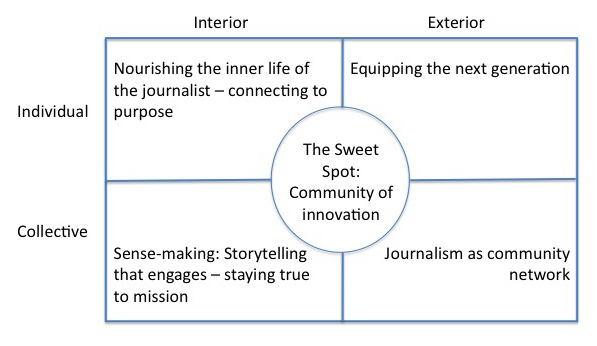 Sufficient clarity emerged to describe not the “next newsroom”, but rather, a new “news ecology”. This articulation holds the promise of providing inspiration and direction for an industry in crisis. Also significant, given that a key intention of this meeting was to produce fundable proposals, a remarkable 11 of the 16 final-day participants identified projects they intend to pursue, including efforts in West Oakland, CA and Atwater, MN along with several ideas intended to accelerate the growth of this new eco-system of journalism, such as a handbook for media transformation and a program for creating change in newsrooms. While we are under no illusion that all of these projects will come to fruition, given the roles and commitment of the participants, we expect many will find traction and funding. Detailed reports written by the participants provide more depth (see the appendix). Shaping a new “master narrative”— Recovering the mythic story of journalists as conveners and navigators through a changing world prepares them to support communities in shaping a new national “master narrative” for our times. Ready, Fire, Aim – A strategy of “just do it,” moving from idea (ready) to implementation (fire) without months of planning (aim). Participants included delegations from West Oakland, rural Minnesota and the Donald W. Reynolds Journalism Institute at the University of Missouri School of Journalism. While the Missouri School of Journalism was our host, faced with pressing issues outside of this meeting, most of their participants left early. In spite of their absence and with their good wishes, the gathering blossomed with a new clarity about the emerging news ecology and how to grow it. There was a desire to see if Fetzer Institute is interested in pursuing an earlier conversation about “formation” work with journalists. o The course will use exercises, case studies and experience sharing to help journalists connect with their original passion and goals for entering the profession. After reconnecting with the “inner journalist,” participants will be asked to discuss and shape a vision for how to change their news organizations to support the passion and purpose common to those who enter journalism. This will be based on community connection. o The content on leading change will focus primarily on how people who can become informal leaders of change and the need for change to come from the ranks of news organizations and not from the top down. Partnerships with the emerging citizen journalist and attracting young people into the field were explored in many sessions. Existing models, for example, the volunteers at KAXE, provided working illustrations of successful citizen involvement. The University of Missouri’s approach to training professionals was characterized by one participant as “experiential, relevant, service-oriented, and adaptive”. Foster excitement in journalism by forming partnerships with organizations right in the community, such as the Boys and Girls Club. Go in there and start a newsletter, and by showing kids how powerful this medium can be, you may turn someone on to journalism that would have never considered it as a career path. If someone has an idea, for a radio show, give them a 5-10 minute spot. Let them do it, then ask How did it go? You don’t have to commit to a long-term program …. Can it be sustained? …. Just do it once, and if it works, do it again …. 4-5 times, and then you’ll know if this should continue. A journalism festival, where we call young people to action and bring working journalists together with youth and elders to get people excited about going into journalism. A pilot class in the fall called “Citizen Journalism and Community” at the University of Kansas, with the idea of developing it into a proposal to seek funding for a broader curriculum project. Whatever the economics, delivery technologies, or changing roles, journalism as sense-making remains a central and sacred responsibility. Journalists play a key role in shaping the “master narrative” that informs our collective story. Telling stories “that empower audiences rather than discourage them” is a skill for our times. Whether citizen journalist or professional, inspiring audience to ask, “how do I get involved?” fulfills a journalistic mission. One participant spoke about beginning stories by answering the question, “why should you care?” In doing so, zoning, a deadly dull yet vitally important civic issue comes to life. A video about Public Insight Journalism at Minnesota Public Radio provided multiple examples of citizens inspired to get involved as a result of engaging stories where their experience fit in. Citizens are out of practice at “consuming” watchdog journalism. They don’t see it that often, they don’t know always how to recognize it or how to demand it. There is a need for the teaching of smart media consumption and creation. Who has that role? State curriculum frameworks mandate the teaching of “civic education” and our schools claim to be about graduating good citizens, but they really are teaching to tests and the tests are more oriented to job skills. Thomas Jefferson was quoted as saying schools were about providing people sufficiently educated to be effective citizens in democratic process. Don’t journalists have some obligation – out of necessity – to make sure their customers know how to identify and use the product in a civic context? A course to look at journalism within its purpose of engaging the audience. It will help participants tie the goals they embrace for journalism with the community connection needed to achieve those goals. In particular, it will shape a new perspective on the impact of various types of reporting. Its aim will be to provide “an appreciative lens for hard news” that empowers audiences rather than discourages them. From the opening evening, when the “next newsroom” was recast as the “new news ecology”, a “newsroom without walls, integrated into the community” was embraced as the emerging future. With several successful experiments in the room — www.villagesoup.com and the Missourian’s www.columbiamissourian.com/emprint — emerging trends in community engagement generated substantial interest and ideas. Multiple sessions offered “tours” through highly successful web sites, successful because they involve people in creating and sharing information that matters to them. For example: www.ohmynews.com, www.myspace.com, www.flickr.com, and http://del.icio.us. Side by side with the emerging new media world were numerous discussions about values essential to journalism – providing information that impacts civic affairs, holding powerful people accountable, being a synthesizer of the truth. This gives further support to ridding journalism of the notion reporters are detached flies on the wall, and gives support to us embracing our humanity AND possessing the skills to offer appropriate balance and fairness as opposed to objectivity. While no clear answer emerged for handling the large, tough stories, the critical importance of “powerful journalistic organizations holding powerful people accountable” was expressed. Whether the emerging models are a few large organizations, a strong network of smaller organizations, or, more likely, some combination remains to be seen. The economic underpinnings for quality journalism are shifting. So much is moving online. The ad model, even if it fully transfers on line, there are more players in it, so the actual money that goes to journalism is going to diminish dramatically. As we try to figure out new ways to involve citizens, we need to be open to a whole new range of ways of finding revenue. This discussion is about being able to understand what the experiments are only in the sense of we don’t know what the new world is but if we can track experiments, it gives us a leg up. Part of the new economy is that we all need each other. No one outlet can provide everything to everyone. A mix of niche players and larger outlets that provide pointers to vetted partners is one possibility. Journalism as connector requires a shift not only in how news is gathered and delivered but in the economic relationships that support it. Revenues come from multiple sources. There is still a role for ad revenue. In fact, online ads provide attractive possibilities of multi-layered information (such as real estate ads where you can “tour” a house) not possible in print. Other sources include: mission-based investors – not looking for a market rate of return, foundations, and subscriptions for content. Treat information as inventory. The Village Soup provided a service to audience while uncovering a new revenue source by making a business’ inventory, whether menus or items available in the store, open for viewing. They took a traditional relationship and enhanced its value. Atwater Soup and Westside Soup (in West Oakland) are two projects with promising futures. Included in these experiments were: a satellite office, a mobile unit staffed with professional interns, a center for community members young and old to meet. In addition to these ambitious possibilities, with a shift in orientation to community network, many simple-to-implement ideas surfaced. For example, being an aggregator of links to church bulletins, interest group newsletters, or other sources that provide opportunities for new partnerships in the community. The need for universal access was touched upon, as information migrates more and more to electronic forms. From many experiments, the new ecology shall emerge. As journalism strives to bring together the communities in which it serves, so can this new ecology foster a spirit of experimentation and mutual learning. Imagine a “greenhousing” organization that supports innovation and sharing among news organizations. From urban West Oakland to rural Atwater, relationships were created at this gathering providing the nascent seeds of change. The Media Giraffe Project could be an incubator for the Village Soup Commons to get established. Village Soup Commons – that is a way to connect West Oakland and Atwater. The other piece is we’re going to create this real live kit that includes the content management software, the consulting of how you do it and network if you want to be an entrepreneur. A toolkit for you to be a new media entrepreneur. The process used for this gathering brought a powerful sense of renewal to participants identifying both individual and collective possibilities for action. Many participants noted how effectively it engaged them on multiple levels – individual and collective, their inner life and their outer world. The essential principle of the process is an invitation for participants to take responsibility for what they love. In doing so, they consistently reconnect with their own internal passions and they discover that collectively, no matter how different they seem to each other, they care about the same core ideals. This discovery reconnects people to the larger whole, while celebrating the uniqueness of each individual. The process began with personal invitations from the October meeting participants. The willingness of busy people to take the time and reach out to their networks is a testament to the commitment generated by this approach. Because the invitations came from trusted associates, we were able to bring together the diverse spectrum of the industry. – to energize the meeting by jump-starting the reflections and conversations. Participants shared summaries of their interviews with each other. Bios were also provided, helping people understand the depth and breadth of their collective experience. The first evening started with each participant speaking to why they came. A “Samoan Circle” followed. This variant of a fishbowl with four chairs in the center of a circle of chairs began with some of the October participants in the center. Anyone who wished to join them was invited to take a center chair as space opened to discuss the convening question: “What is the next newsroom and how do we create it?” This process provided an interactive means of sharing (most participants spoke) and building on the information gleaned from the previous gatherings. It set a tone that the conference had a solid foundation that could be built upon through the expertise in the room. It also changed the focus from newsroom to news ecology for the rest of the session, a tribute to the responsiveness of the form to assimilate important ideas quickly. …the outer activities of collective daily life. A report of the sessions was created on a web site established for that purpose. The session notes were written by participants (see appendix). Finding a home for Journalism that Matters itself could provide the “greenhouse support” for sharing learning among these efforts. Several possible sites emerged to pursue.